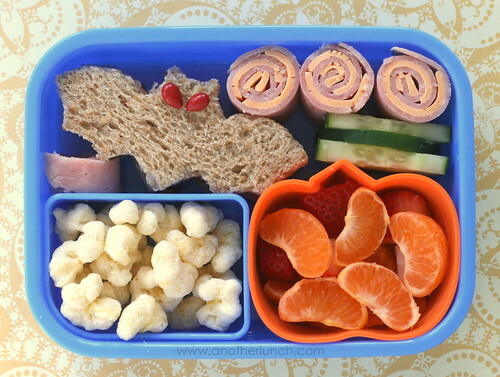 His batty bento - the leftover sandwich cut with a bat shaped cookie cutter, a few ham & cheese roll-ups, cucumber slices, clementine orange segments and chopped strawberry in a pumpkin shaped silicone cup, some organic "pirate booty" stuff. The bat's eyes are chocolate covered sunflower kernels. This bento is packed in a Paperchase box, using only one of the three inner dishes it came with. Paperchase is (was?) 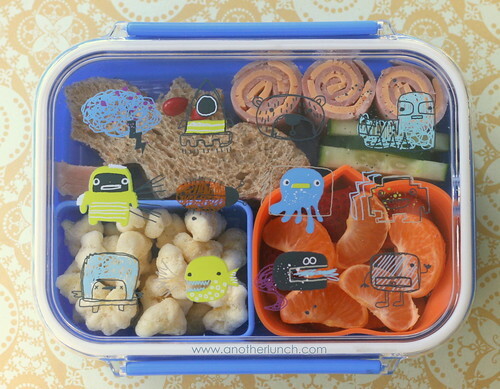 a company that made cute novelty stuff, some bags and containers, lots of stationary items, stickers, etc. Borders used to carry their stuff, but since Borders has gone belly-up I have no clue where Paperchase stuff can be found these days (besides the UK). Bummer. :( Luckily I was able to snag a few of these boxes way back when (I have two, and provided the third in a giveaway).